The Student Volunteers (SVs) make INTERACT happen. SVs are key contributors to the conference, managing many important details of the conference on a day-to-day basis. To become a SV, you must be a full-time student during INTERACT 2017 Mumbai, or must have been a full-time student till June 2017. 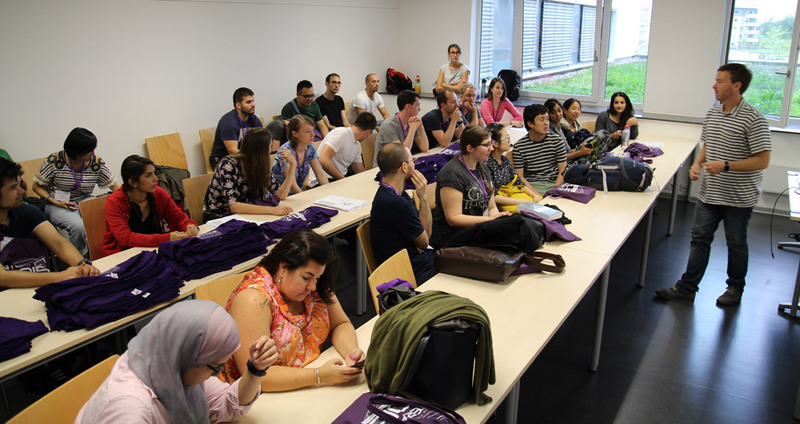 As an INTERACT Student Volunteer, you will have the opportunity to participate in the conference, attend sessions and meet other students and well-known HCI researchers from around the world. You will be in a privileged position to meet people whose papers and books you have been reading as a design enthusiast. All SV Lotteries have been announced and those selected have been informed via email. Those not selected will be placed in the waiting list. Reach out to sv[at]interact2017[dot]org, if you have any questions. We are looking for motivated, enthusiastic and reliable student volunteers, who are capable of working within a diverse team and support the conference behind the scenes. Depending on how the budget of the conference works out, you may also get some help with accommodation expenses, though this is NOT a promise yet. SVs must agree to arrive at the conference early (see details below), work for allotted number of hours, show up on time to tasks, and attend the orientation sessions. Among others, the following tasks await you: assisting with the conference registration; preparation and setting up of the conference rooms; technical support of the sessions; answering attendees questions. The SV chairs will allocate work to SVs before and during the conference. At INTERACT 2017, there will be three types of student volunteers — Local SVs, Non-local SVs, and SVs who have a submission accepted at INTERACT 2017 Mumbai. As the name suggests, Local SVs are local to Mumbai. They need to put in at least 40 hours of work. Their work may include managing the registration process, design of INTERACT 2017 collateral, coordinating with local suppliers of venues, social events, food, etc. Much of their work will happen before the conference (in some cases, way before the conference) and some during the conference. They must commit to be available during this period. Non-local SVs and SVs with an accepted submission at INTERACT 2017 need to put in at least 20 hours of work. They must reach the conference venue on or before 4 pm on Saturday (September 23, 2017). Some of their work will be before the conference and some during the conference (e.g. providing help with kits, signage, venues and registrations, managing translations during field trips, or helping people travel). At the moment, INTERACT 2017 plans to support 20 local SVs, 25 non-local SVs and 10 SVs who have an accepted submission at the conference. If the conference budget permits, this number may be enhanced. All applicants will have to pay the student registration fee. Meanwhile, if you get an acceptance notification from any of the INTERACT 2017 tracks, you should forward it to sv[at]interact2017[dot]org. Please note that only people who have already registered for the conference will be considered for the SV selection. As you can see, students who register early get more chances of getting selected as an SV. Students who have an accepted submission too have an even higher chance of getting selected. Selected SVs must arrive at the INTERACT 2017 venue on or before 4pm on Saturday (September 23, 2017) and report to the SV Chairs for the orientation. If you don’t show up by this time, you will be treated as a no-show and your student volunteership will be forfeited. In exceptional cases (such as floods or earthquakes), if you are not able to reach in time, you must inform the SV Chairs beforehand and take their approval to skip this meeting. Students who have not been selected as SVs till August 15, 2017 will be allotted a position on the waiting list. Such students should also reach the INTERACT 2017 venue on or before 4pm on Saturday (September 23 2017.) In case of any no-shows, such students will offered a student volunteership on the spot at this time. Once the SV Chairs report that an SV has completed the required number of hours, he/she will be refunded the registration fee paid. Please note that if you cancel your registration for INTERACT 2017, the cancellation policy will apply for your refunds. If you are interested in being a SV, Register as a Student and select “I would like to register as a Student Volunteer (SV)”. If you have any questions or comments please contact the Student Volunteer Co-chairs at sv[at]interact2017[dot]org. Q.1: Can I skip paying student registration fees and still become an SV? A: No. Only those who have paid student registration fees will be enrolled in the lottery mentioned above. We are working to make funding opportunities available to students who cannot afford to pay these fees. We will announce them on this page once they become available. However, if you can, do register as a student and apply as an SV, as this will give you a higher chance to attend the conference for free. Q.2: All the SV selections have been announced, but I really, really want to be a student volunteer. Is there any way I can? A: If you will be attending INTERACT 2017 anyway, you may still register as a student and opt in for being a volunteer. If all selections have been announced, your name will be added to the end of the waiting list. That way, there is always a chance you may get selected in case of no-shows or in case the number of SVs are increased. Q.3: I want to skip orientation, or work less than the allotted hours, or arrive on Sunday, can I still be an SV? A: No, sorry. You always need to do all the work that is allotted. In exceptional cases (such as floods or earthquakes) if you are not able to reach in time, you must inform the SV chairs beforehand and take their approval to skip the orientation. Q.4: I didn’t get your emails and/or forgot to register by the deadlines you guys sent us and I lost my spot as an SV, can I get it back? A: No, if this is due to you missing out on the emails, sharing incorrect information during registration, or just forgetting to respond in time. In case you want to apply after all selections have been announced, refer to Q.2. Q.5: Can I choose the work that I do? A: Sometimes. If there is something you are really great at, let the SV chairs know in the registration form.